Thanksgiving has come and gone and now we’re in the thick of holiday shopping. After Thanksgiving everything seems to be in high gear with people scurrying here and there getting ready for holiday cheer, family and friends, and lots of gift giving. When I was younger it was so exciting to hit the shopping centers for Black Friday, but now I dread getting close to them. In fact, I’ll only visit the malls during the weekday now just to avoid the crowds. With the crowds come pushy people, crowded spaces and catching the wind of someone coughing or coming down with a bug, only to transfer it to some passer by. 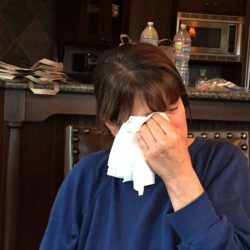 Somehow right around Thanksgiving someone managed to pass a germ along to my entire family and between the coughing, runny noses, and aches and pains the only thing that sounded good to eat was soup. Not just any soup but Homemade Chicken Soup – good ole homemade penicillin! Making your own pot of homemade chicken soup is so easy and the aroma alone that permeates through your house is enough to make you feel better. 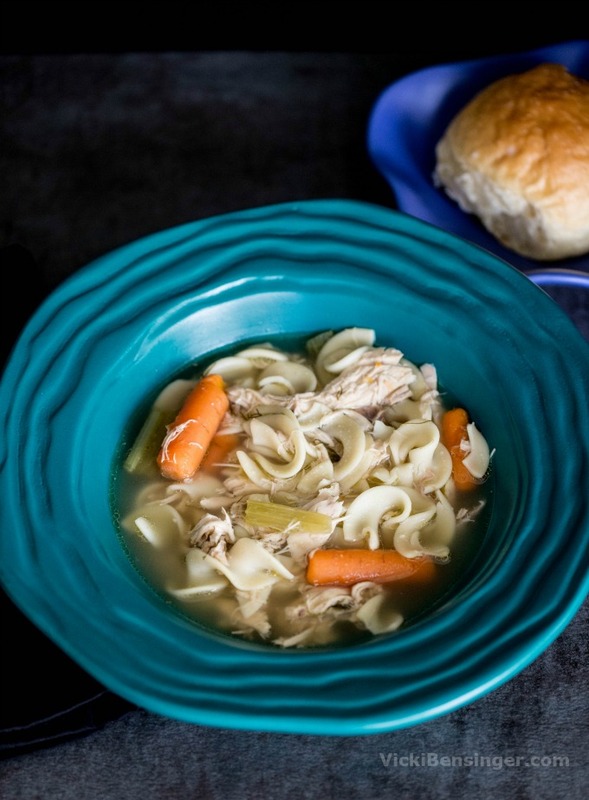 With just some basic ingredients, a whole chicken and stock pot, you’ll have a warm healthy pot of Homemade Chicken Soup ready in no time at all. Cold and flu season is upon us. 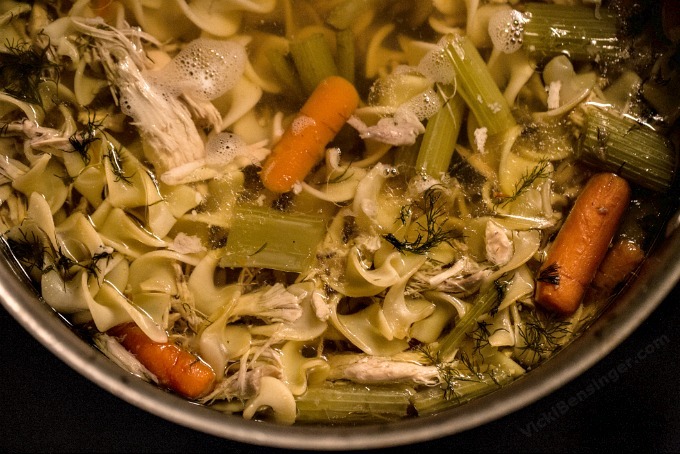 To cure whatever ails you make a pot of this Homemade Chicken Soup with Noodles. 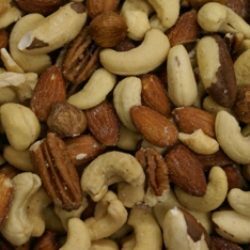 Make ahead and store in the freezer for when that cold or feverish day arrives. Place the chicken into a large stock pot. Cover with water. Bring water to a boil over medium high heat. Allow chicken to boil for 10-15 minutes, skimming the foam and particles that rise to the surface. After skimming, if needed add more liquid to cover chicken. Add carrots, celery, onion, parsley, dill, salt, pepper, bay leaves, and garlic cloves to the pot. Bring water back to a simmer then cover leaving room to vent. Maintain a slow simmer to insure the soup remains clear, not cloudy, for 2 hours. Carefully remove the chicken from the broth and place onto a large plate. Once the pot is cool enough to handle carefully strain the broth into another pot using a fine mesh strainer. Reserve the vegetables and herbs for later, if desired. Remove bay leaves, onion, and any bones that may have fallen off the chicken when removed from stock. When soup has cooled completely, skim layer of fat (gel) from top of the broth, if desired. Pull meat from chicken bones shredding into bite-sized pieces, being careful to discard all bones. 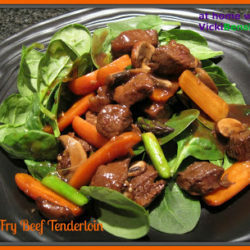 Add cooked vegetables and chicken pieces back to stock and reheat. When broth reaches a simmer add in noodles of choice, or rice until al dente. Serve hot, garnishing with fresh dill or parsley, if desired. Once cooled, leftovers may be packaged and stored in the freezer for later. Notes: Once the soup is chilled a layer of fat will rise to the surface. If desired skim off and save (to be used for frying) or leave on as it adds wonderful flavor and silkiness to the soup. This layer of fat is called "schmaltz" - which is rendered (clarified) chicken fat, often used for frying in place of oil. Tip: Leaving the skin on the onion adds a nice golden color to the broth. Just be sure to give it a rinse before adding it to the pot, then removing the skin before serving, along with the onion. Optional: If desired for added flavor and color, add a small pinch of saffron threads to the pot once all veggies and chicken have been added back. Pressing threads into the palm of your hand to crush before adding. It's believed that Homemade Chicken Soup may actually have medicinal benefits thus given the name "Jewish Penicillin." Too bad about your cold! I’ve escaped that, thank goodness (fingers crossed, hoping my luck holds). Anyway, who doesn’t love chicken soup? And crave it when they’re sick? 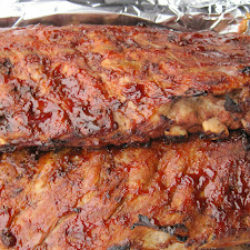 This looks super — wish I had some right now! Thanks so much. I know I hate having colds they really drag you down. Nothing a little chicken soup can’t help cure. I think I need to make another batch already. I make a very similar chicken soup recipe—with fresh parsley and dill, too! It comes from a Jewish friend, and it’s just fabulous. Hope yours helped with your nasty virus!!! Still trying to knock this out as is the rest of my family. I may need to make another batch of chicken soup and maybe make it even stronger! This is indeed better than medicine and very delicious too! 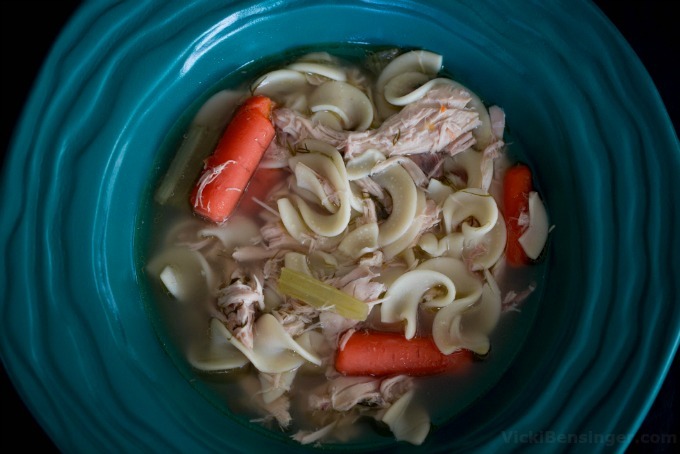 Chicken Soup is great comfort food and is proven to help what ails you. We’re still trying to fight this off. Hopefully by Monday we will all be feeling better. This is actually better than a shot of penicillin! 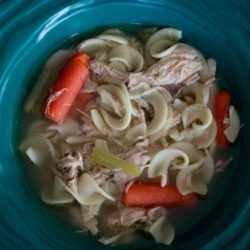 What a hearty and healthy bowl of chicken noodle soup! I make it every time we get that nasty cold bug. Works like a charm. Sorry you and our family got sick. Hope everyone is feeling better.